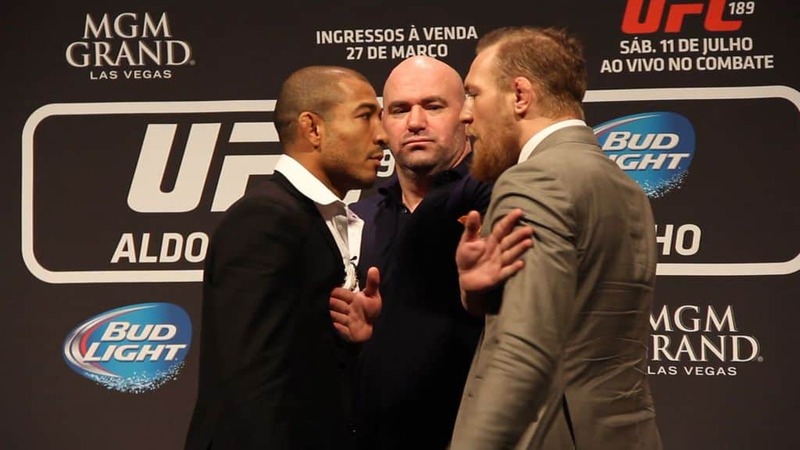 UFC 194 will go down on December 12th, 2015 at the MGM Grand in Las Vegas. Currently, the event stands to be not only the biggest of the year, but one of the biggest of all time. Stacked from top to bottom, this outstanding fight card is complemented by two world title fights—Conor McGregor against Jose Aldo in the main event, and Chris Weidman against Luke Rockhold in the co-main event. The main card isn’t carried solely by its exciting main and co-main events, either—the rest of the card is similarly stacked. 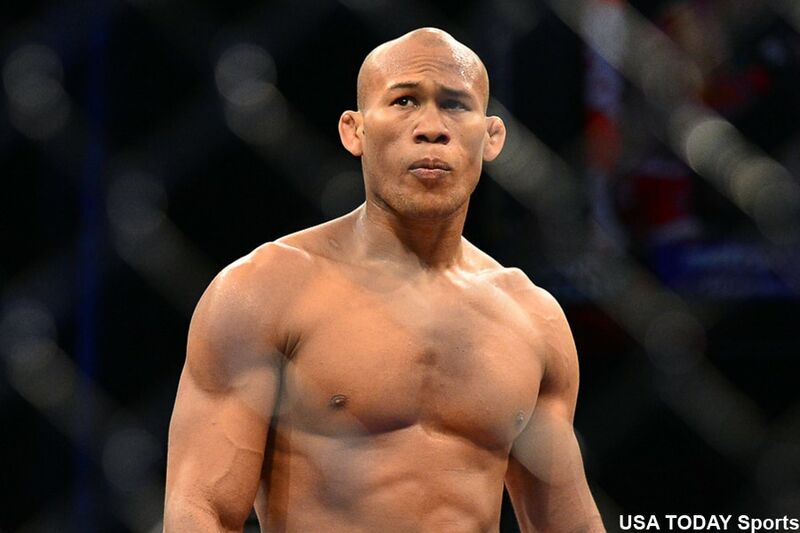 In the featured bout of the night, BJJ-specialist Ronaldo “Jacare” Souza will battle middleweight-powerhouse Yoel Romero in a fight that could very well determine the next man to battle for the middleweight title. That outstanding fight is preceded by an intriguing welterweight match-up between long-time contender and BJJ World Champion Demian Maia, and an extremely talented submission specialist and training partner of Conor McGregor in Gunnar Nelson. The main card kicks-off with a featherweight tilt between two of the division’s most violent and exciting athletes, as the surging Max Holloway meets the seasoned Jeremy Stephens in a bout that will have a massive impact on each man’s career trajectory. Needless to say, this main card really is one of the best in the UFC’s history. 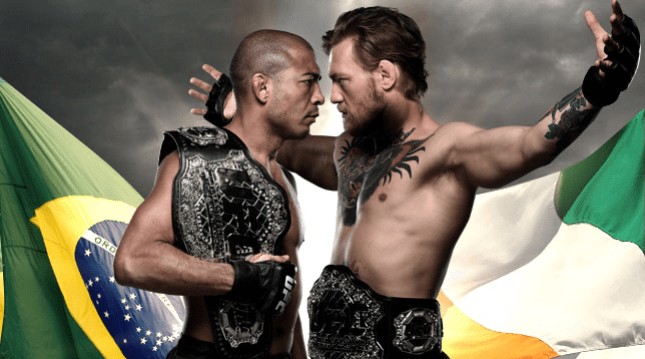 Let’s take a look at all of UFC 194’s main-card fights! Heavily anticipated and a long time in the making, this title unification bout has a great deal of hype and excitement behind it. McGregor has demonstrated that all of his talk outside of the Octagon is backed-up by real skills—he’s now finished the elite Dustin Poirier and Chad Mendes via strikes—an achievement that few (or in Poirier’s case, no other) men have claimed. His versatile striking is backed by a functional ground game and an iron chin. McGregor is the real deal, and certainly has the tools to win. But he’ll need to make use of all of these tools against Aldo, who is one of the best fighters of all time. He’s defended his strap against the likes of Chad Mendes (twice), Frankie Edgar, and Ricardo Lamas in impressive fashion—he has the ability to win no matter where a fight takes place. His strikes—specifically his leg kicks—are vicious, and can land from anywhere. His ground game is excellent, and although fans aren’t able to see them much, his submission skills are certainly outstanding. This is one of those fights that can go either way. It’s become clear that McGregor has the ability to finish any featherweight in the world, on any given night. Aldo is of course one of the most dominant MMA fighters in the sport’s history—he too has the tools to win. The difference here may very well be the ground game of each fighter. McGregor’s two career losses have come via submission, and for as versatile as Aldo is, he may very well be able to get the fight to the ground. One thing’s for sure: this is going to be a fight to remember. In a fight that could be the main event of a mass of other fight cards, reigning middleweight champion Chris Weidman will battle the always-dangerous title challenger, Luke Rockhold. Chris Weidman has made a career out of defying the odds. The elite wrestler was widely expected to be dispatched against Anderson Silva in their first encounter, especially if he couldn’t get the fight to the ground. Weidman connected with strikes on the feet and won the fight via knockout. He was expected by many to lose to “The Spider” in their second encounter, which he dominated in impressive fashion. The same was true when he competed again karate-expert Lyoto Machida, and won the fight via a clear decision. Weidman is a well-rounded and elite athlete who can hold his own no matter where the fight goes. Luke Rockhold is similarly elite and well-rounded. He has impressive submissions—made clear against Tim Boestch, Michael Bisping, and Lyoto Machida—and can stop anyone in the world. His ground strikes are similarly effective (he tagged Machida badly on the ground), as is his stand-up game (the Bisping fight’s end was set in motion by a well-placed head kick). Rockhold and Weidman both represent the next generation of MMA athletes—they can compete and win in any aspect of the game, and seemingly have no weaknesses whatsoever. Both of these athletes are incredibly skilled, and have a future in the elite regard of the sport. However, it’s hard to shake the idea that Weidman is just slightly better everywhere. Rockhold has great striking, but Weidman is just a bit quicker and more technical. The same can be said for the wrestling and ground game of each man. It’s hard to say who comes out ahead, but Weidman should have the edge anywhere the fight goes—albeit not by much. The fans should enjoy this one, and the judges should hate it. Romero vs Jacare is a fight that many fans have been waiting patiently for, having been originally scheduled for UFC 184, and then UFC on Fox 15, but being cancelled due to injuries to both men. A more impressive late-starting career than the one Yoel Romero has put together will be hard to find. 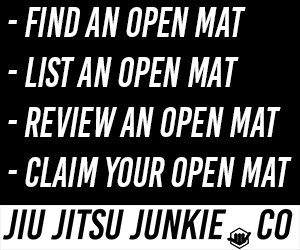 The thirty-eight-year-old Olympic-Wrestling champion has found an unprecedented amount of MMA success, and now sits atop an outstanding six-fight win streak. His violent finishes have come as a result of his devastating strikes and wild in-cage tenacity—not his technique or form. Nevertheless, he’s so athletically gifted that to this point inside the Octagon, his technical deficiencies have been overruled by his brutal power—much to the delight of the fans. Jacare Souza is essentially the opposite of Yoel Romero, in terms of fighting technique and style. A calculated submission specialist and BJJ World Champion, Souza has used his outstanding ground skills—and impressive striking game—to dominate the likes of Gegard Mousasi, Derek Brunson, and Yushin Okami. He’s so well-rounded that most fighters simply don’t know how to function while sharing the cage with him. With this considered, one should make no mistake about it: Jacare wants this one on the ground. If the outcome of this fight were to come down to the pure wrestling games of Romero and Souza, the Cuban would certainly have the edge. However, this isn’t a wrestling match, and the technical and positional deficiencies that Romero has covered-up with sheer power in the past may be exposed here—in the form of a takedown and late submission. This is another fight that’s sure to be fun to watch. Especially because of the ground pedigree of each man, this should be an awesome fight. Demian Maia is a grappler—plain and simple. Few athletes are so developed in one area of the game that they can consistently dominate the opposition using only these skills, but Maia has pulled it off for nearly a decade—holding wins over Chael Sonnen, Rick Story, and Jon Fitch, to name just a few. 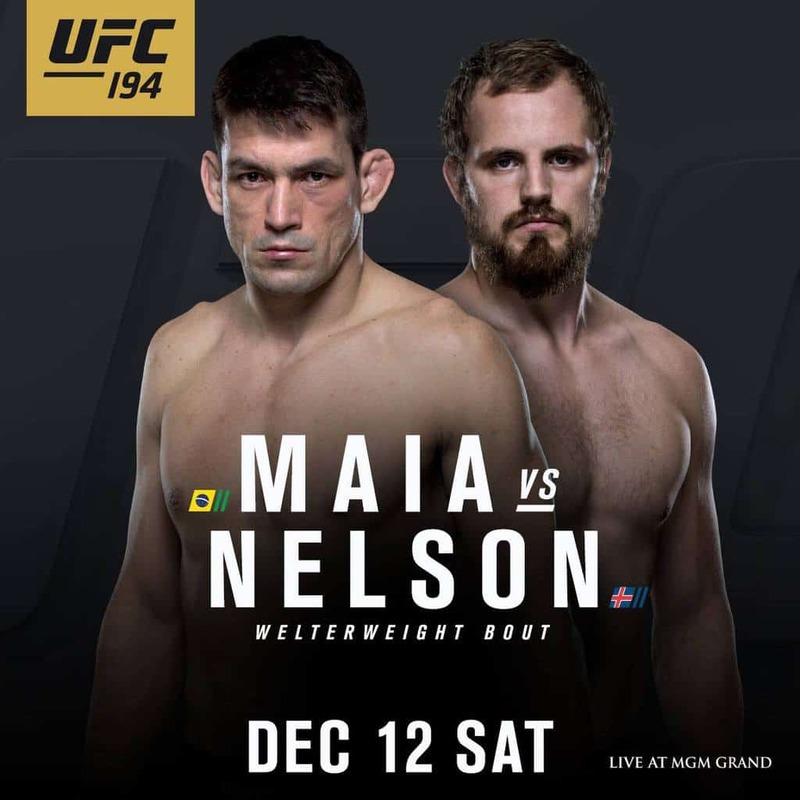 Against Nelson, although the advantage isn’t overly pronounced, Maia will be at a striking disadvantage, and should seek to get the contest to the ground. Gunnar Nelson has a similarly impressive ground game—although he isn’t as decorated or as proven as the Brazilian, inside the cage. His devastating skills have led him to notable victories over Zak Cummings and Brandon Thatch, and although his ground game is once again solid, that’s not where the Icelander will want the fight, as he probably holds a distinct advantage on the feet. The key to victory here for Nelson is to keep the fight standing—and there’s an excellent chance that he has the defense and skills to do so. From there, his stand-up should take over, and he will probably roll to a unanimous decision. Should Maia get the fight to the ground, however, he will probably have the edge. This is an excellent way to start the main card. 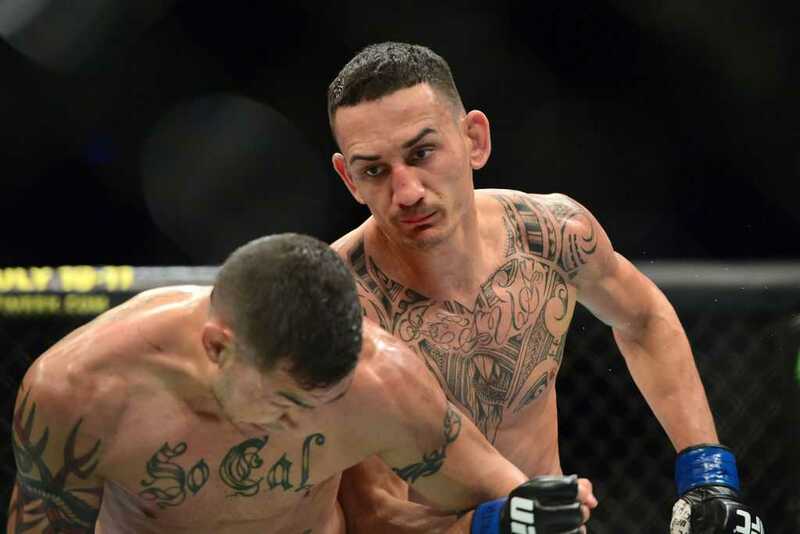 Max Holloway is one of the most underrated fighters on the UFC roster. His impressive victories inside the Octagon have demonstrated that he has an elite striking game, as well as a well-tuned grappling skillset. During his current seven-fight winning streak, the young Hawaiian has proven that he has put all of these skills together—he holds recent victories over Andre Fili, Cole Miller, and Cub Swanson. He should be careful to not get sucked into a brawl here, though—Stephens has made a career out of winning dogfights. And he’s attracted a ton of fans along the way. After competing in the sport for a decade, and the UFC since 2007, it’s hard to believe that the seasoned veteran is just twenty-nine years of age. Along the way, he’s had ups and downs, but has consistently competed against the best the sport has to offer—holding wins over Rafael dos Anjos, Darren Elkins, and Dennis Bermudez, to name just a few. The Bermudez win was much-needed, and came in his prior outing; in that fight, Stephens demonstrated that he finally has the ability to put together his vicious strikes, solid ground skills, and years of experience to form an outstanding overall game. However, for as skilled as he is, it may not be enough against Holloway. The reality of fighting Max Holloway, for the majority of fighters on the roster, is that his skills are sharper and more-developed than their own. He’s quick, powerful, and most important of all, he’s constantly improving in every aspect of the game. He should have the edge over Stephens here no matter where the fight goes, but the one thing that Holloway doesn’t have is a decade of professional experience. If Stephens can make this a real brawl, he has a chance of finding a hard punch—and the victory. It’s unlikely, but one thing’s for sure: neither man will back down during this contest. The fans should enjoy this one as well. As was said, UFC 194 really is going to be one of the best fight cards of all time. Be sure to tune-in when the action goes down live on pay-per-view on December 12th. Enjoy the fights!